Originally introduced in January of 2017, the Christophe Claret Maestro is a high horology timepiece, that features the movement components on the dial side of the watch (similar to this timepiece), and a case that is quite wearable compared to other models from the brand, at 42 mm x 16.06 mm. 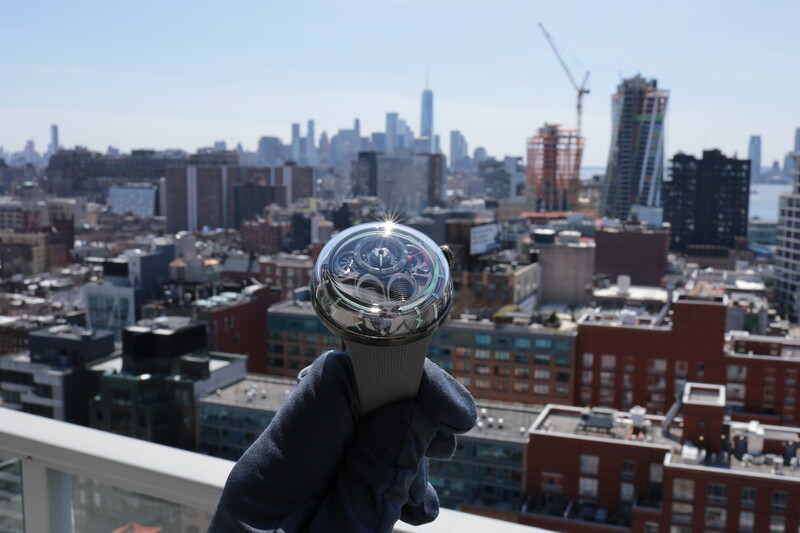 Although this watch is now more than two years old, there are still some of the 176 limited editions (88 in 5N gold and 88 in titanium were made) available, as is often the case when you’re talking about a watch that costs $68,000 in titanium and $76,000 in gold, both available at Cellini Jewelers at the time this was written. 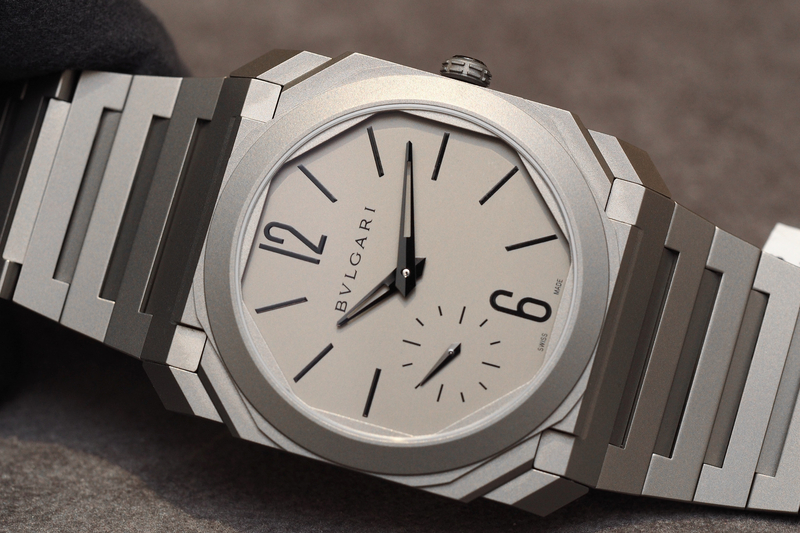 One of the first things you notice is the ultra-domed sapphire crystal which protects the entire dial and has no bezel. This presents an unobstructed, three-dimensional view of the watch mechanics, that would usually be located on the caseback. Through the watch crystal, you can see the hour, minute, date, power reserve indicator, and memo displays, including the prominent polished cannon pinion that the two-tone hour and minute hands are stacked on. The flange has the minutes chapter ring marked with printed graduations, and just inside of that, at a move of an angle, and against a brushed black surface, are the hour indices, with the Christophe Claret emblem applied at 12 o’clock. That’s just the time, but you also have a large cone-shaped, two-tiered mechanism, topped with a large natural sapphire in red, with Arabic numerals, located at 5 o’clock, which rotate together, to display the date in between the teeth/aperture. There’s also a similar cone-shaped display, in between 3 and 4 o’clock, that acts as a “memo” function which can be toggled back and forth using a pusher on the right flank, to remind you of something important, in the way that you may “tie a knot in your handkerchief” to remember to do an important task. Christophe Claret’s in-house caliber DMC16 movement is hand wound and uses two series-coupled barrels at 12 o’clock, with a 168-hour power reserve (7-days). The blade spring at 8 o’clock, which is integrated into the balance bridge, indicates how much of the power reserve remains. Also connected to the balance bridge is a free-sprung balance wheel, made in the same finish as the case (gold or titanium), and with contrasting adjustment screws in red or blue. Just below you can see the escape wheel and pallet. Each prominent Charles X style bridges is rose gold or titanium, secured by either a polished silver or blue screw. These matte finished bridges are chamfered by hand and feature 26 difficult to produce interior angles (anglage). There are 33 jewels in total, 3 are natural rubies or sapphires (which is unique in that most jewels, in general, are synthetic not natural), and 1 natural diamond. The back, like many watches which have most of the components on the front, is less spectacular, but still pays incredible attention to detail with darkened, frosted bridges. 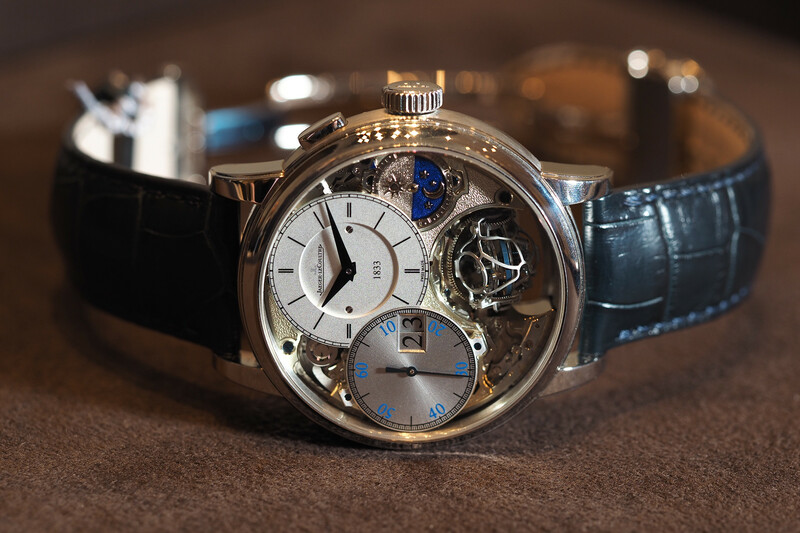 Overall, the Maestro has the eye-catching design of timepieces you might see from a Jacob or MB&F watch alike, but in a very conservative and wearable size that lacks the ostentatiousness we’ve come to expect in the haute horology category. Personally, it’s my favorite watch made by Christophe Claret, alongside the new Angelico (which has the same case style and look in an even smaller case), and despite photographing the 5N rose gold version, I prefer the sportier titanium variant. There are also three additional limited edition variants that came out after the original rose gold and titanium Maestros in 2017. 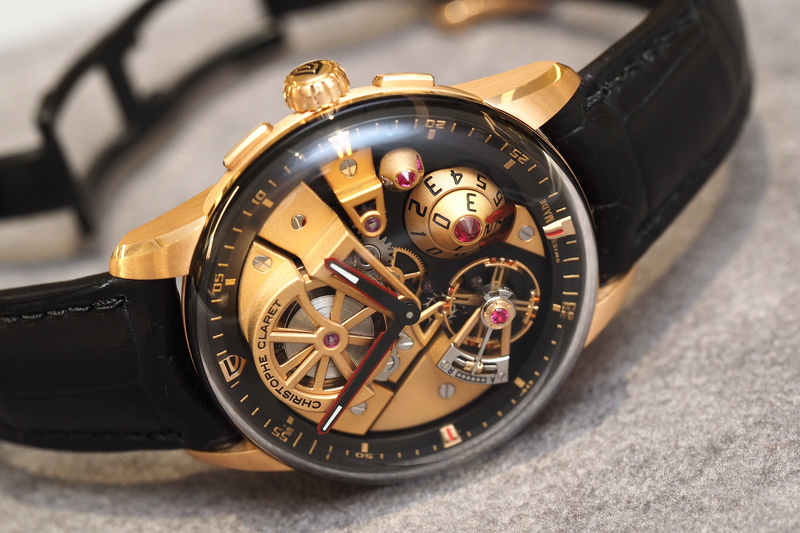 Learn more at Christophe Claret.